Chelsea & Ali had so much fun doing this amazing keratin blowout last week…. check out these before and after pics!!!! This products restores and protects, maintaining hair’s natural properties by creating a shield over each strand and restoring it from the inside out; while protecting against harmful UV rays, pollutants, chemical treatments and the rigors of daily shampooing and styling. This hair taming treatment can be used on all hair types to reduce frizz with maximum curl reduction while adding shine and leaving the hair more manageable. It can be applied on previously chemically treated hair such as; color, lightening, Japanese straightening or relaxed hair. Applications on virgin hair types will see improved results after each application. 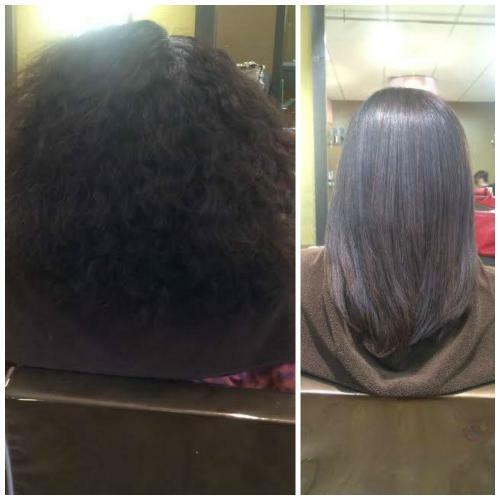 Call us today to schedule a complimentary consultation to find out if this is right for you and finally get your hair tamed !!! !